The present city of Heraklion was founded in 824 by the Saracens. In 1204 was bought by Venetians which build enormous fortifications, most of which are still in place. Here we can find almost everything: food and fruit, clothes and shoes, household utensils, fabrics, folk art, sweets or anything else you can think of. The smells, the crowd, the loud voices of the people selling their goods, the vast variety, the stalls, the colors, the fresh produce and the very good prices are bound to impress you. After our walk in the bazaar, we will have the chance to get to know of Heraklion. Of course, a walk of a single day is by no means enough for anyone to see and admire all the beauty of the city, but a stroll on its streets is going to surprise you in a pleasant way. 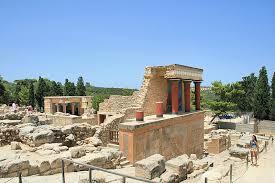 You are going to see a lot of monuments and buildings from different occupation periods of the Crete. The Byzantium, The Ottoman Empire, The Venetian Rule have left their marks on Heraklion. What’s Excluded• Entrance to CretaAquarium for an adult (9.00€).